This site is a labor of love, ('cause it sure isn't for money)! This site is dedicated to my dear grandmother, Vera Mae Faulkner Jones, who has been gone from my life for about a decade now. She introduced me to Christy back in the mid 1970's, and I know how much it meant to her. She is the first person I had Christy/Neil discussions with, and MacNeill was her favorite character, too. It is also dedicated to the very gifted actor, Stewart Finlay-McLennan, who made Dr. Neil MacNeill the complex, intelligent, and romantic character that he is. His MacNeill is the inspiration for this site. Thank you, Mr. Finlay-McLennan, from one of your many "rabid female fans." I know my grandma would have loved you, too. My special thanks to the late Catherine Marshall for her beautiful story and characters. I am usually a snob about books and don't read popular fiction; but Christy proved exceptional, and I am glad I did. A tremendous thanks to Ken Wales for having the vision and the persistence that brought Christy to television for the first time in 1994 and for sharing his vision with all of us. Profound kudos to Patricia Green, the creative force behind adapting the novel Christy to television. Her scripts for the Pilot episode and the series captured the real essence of the story, a remarkable task in itself. I also would like to salute all the other script writers who wrote for the series. It is their talents that gave us these great episodes to watch, analyze, and discuss. A debt of gratitude to Dr. Ron Miller (retired), Dr. Philip Momberger, Dr. Carlos Dews, Dr. Mary Lowe-Evans, Dr. Greg Lanier and all my English Professors in the Masters Program at the University of West Florida. These people taught me everything I know about literary interpretation and how to do a close reading. I consider it one of the most valuable skills I ever learned, and here it is being put to good use. I am also indebted to Sonja Schaefer, webmistress of SFMcLennan.com, who read all my rambling emails, as I shared with her my ideas about Christy and Neil, as unorthodox as my ideas were. She offered continual encouragement, friendship, and guidance, plus she gave of her time to me when I know on certain days she had very little to give. Sonja, you and I are kindred spirits. Thank you to the famous Christy Mail List for keeping me on my toes and constantly pushing me to offer proof for what I write. And thanks to all of the group who wrote me such kind words about my posts there: Shari, Sherry, Debra, Michelle W., Beth, Dawn, and especially Marilyn, a great contributor of Christy FanF iction, who writes with such passion that she is an inspiration to us all. Triple thanks to Tom Blomquist, the Executive Producer of the new PAX Christy movies. He has been most gracious with his time and his resources, and his devotion to this story is evident throughout the new productions. On my recent visit to the set in Vancouver, he made me feel very welcome and spent real time with my group discussing all sorts of Christy issues. 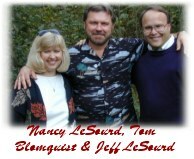 To Jeff & Nancy Lesourd: Thank you for your wonderful comments about NeilandChristy.com. Knowing that Nancy loves this site and its take on MacNeill and Christy is the highest compliment it could receive. I was indeed humbled by their kindness, warmth and sincerity during our recent meeting and hope that this site continues to deserve Nancy's admiration. Thanks to four special people for the recent addition to the site of the exclusive interview with Stewart & Lauren about MacNeill & Christy: Of course Lauren Lee Smith and Stewart Finlay-McLennan for being such sports about it and being adorably sweet, swoony and at times silly with it; And special thanks to Tom Blomquist who actually came up with the idea of having an exclusive interview on the site and made the arrangements for it to happen. You da man, Tom. Thanks to Lisa Koretoff and Dee Jellicorse for the wonderful interview with Brenda Lilly. It is most appreciated to have such devoted fans contribute worthwhile content to the site. It was very generous of them to contact me before the interview and see if I had any specific questions to ask and to offer to let me post the interview online here. I thought to myself, what are they, crazy?--of course I would love the interview for the site. Also a special thanks to Brenda Lilly for allowing this interview and letting me post it here online. From what I could tell from the interview, Brenda is a class act all the way. My deepest gratitude to Shari Ann Snelling (Essay) who not only was present at the interview with Patricia Green and Tom Blomquist and helped keep me focused but also offered to type up the transcript from it, a feat which took hours, even days. That interview lasted nearly two hours and was full of great stuff that Shari Ann worked deligently to get ready for this site. That's her pictured on the right with the very special "MacNeill" in her life. Of course, thank you-thank you-thank you to Patricia Green and Tom Blomquist who allowed me to interview them over breakfast during ChristyFest this year. What a wonderful morning and what two great people. These two know the most about "Christy" of any two people alive; it was my great pleasure to sit and pick their brains. I think this interview is one of the most revealing and engrossing reads on the whole site. And how generous and giving they were of their time to make this happen. I am so delighted to finally have gotten to include original Christy, Kellie Martin, on this site and for her exclusive interview done in December 2001 I must thank two fantastic people...1) Tom Blomquist for making it happen and 2) lovely Kellie Martin for giving of her time in answering my questions. And finally thanks to my business partner, David Goldflies, who thought I might be getting obsessed with this project, but encouraged me anyway. It is through him I have maintained a sense of humor about it all. David is who constantly pushes me to "think outside the box", and anyone who has read my "stuff" will attest that his influence has played a significant part.